Home / / HANDy Tool! I have been a professional painter for 23 years, and about 2 years ago a friend gave me a HANDy Paint Pail to try. At first I was a bit skeptical about trying something new, but I have to say that it has made my life so much easier and I won’t paint without one anymore! Plus there are disposable liners that make cleaning up take half the time. It isn’t too expensive and can be found all over. 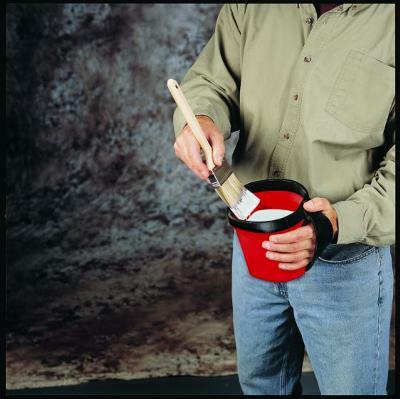 So that’s my tip – try a HANDy Paint Pail. If you’re having trouble finding one, you can go to the website HANDy Paint Products to find where they are sold. This product is fantastic. Very easy to use. We have moved three times over the past five years and painting those houses would not have been easy without the HANDy pail. It’s really nice when you’re switching colors or even at the end of the day to not have to wash out the pail (disposable plastic liners). We bought ours at Lowe’s, but I think you can also get them at Home Depot. I couldn’t agree more. What a wonderful tool! I recommend the other HANDy tools as well.